Ontario Z Car Owners Association recently celebrated its 20th year with a bang! 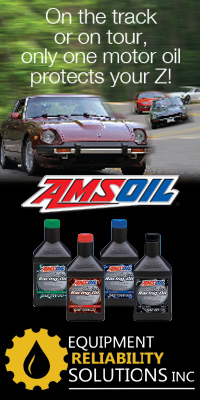 The club has grown through the years to become one of the strongest Z Car clubs in North America. Each season attracts NEW members, young and old and the events keep on getting bigger and better. To celebrate OZC’s 20th anniversary, Z-Fest, our biggest and best car show of the year was hosted at Reif Winery in Niagara-On-The-Lake. To commemorate this historic event, Reif Winery introduced two special edition wine vintages, a red and a white one for OZC. Despite many ups and downs, the club continues to thrive and survive, thanks to the commitments and hard work of the many long term returning volunteers and car enthusiasts. Below are some capsule comments, past reflections and future hopes of some of OZC’s past presidents. Being called the founder of OZC is an honor and a privilege. It was really just an idea on my part to help all the Z customers that had come to my shop over the past 4 years. JP was my official first and I believe Scott was second and Steve Tustin was third and George K was fourth when I was still operating out of my first shop at 90 Russett Av. in Oshawa. After moving to 10 Russett Ave. to a bigger shop I experienced an increase in Z clientele beyond my best expectations. Time after time I experienced a recurring nightmare at around this time. I would order parts from Nissan at ridiculous prices or from the US at even more expense and a few days or weeks later another Z client would come in and ask me if I knew anyone that was looking for a “fibrillated SU composite actuated bit” for a 1965 280 Z ? “I’m asking $150 for it”. Well I had just sold one of those 2 weeks earlier to one of my clients, ordered from the US, for $310. It was time to get together. So I suggested to Scott and JP that we start our own club just for the reason of finding parts to swap and sharing information among members. We called all of my Z clients at the time, of which there were 7 (Scott correct me if I’m wrong) and called them to my shop at a certain time to attend. And not to be long winded, that is basically how the club started. Most important were the following 2 years. Scott Tarras and JP Matte deserve all the credit for making this club a reality. JP won the contest in naming the club “Ontario Z Car”. In hind sight, that was actually a brilliant name, as it is now the only Province wide Z club in Canada. JP’s computer art came up with the torn checkered flag (which I loved). Scott became our first president, news letter writer, do it all member. I became the go between sellers and buyers. Over the next several years the meetings in my shop were getting out of hand as we were now getting Z owners from all over Ontario to attend. It was a sight to behold, me borrowing chairs from the shops next door to accommodate all who attended. My contributions to the club were, at the beginning, more of ideas than actions. Around this time along came George K. What a man to take the bull by the horns. He became our second president, I think, and he is the one that made this club legal with all sanctioning bodies of the Ontario automobile club and racing club organizations. I have to give all credit to guys like JP, Scott and George K that did all the hard work for many years. I am so proud to be a member of this club and I hope that all the little things I did 20 years ago will continue to benefit all our members for many years to come. Let the Z live forever. The club is turning 20 this year. As I say this, I think to myself, wow how time flies. When I was asked to help contribute my thoughts of how the club got to where it is today, I thought it would be pretty easy, but as I sit and think about the early days of the club, so many people and events rush into my mind. I started out knowing no one with a Z car, to meeting literally thousands of fellow Z owners from all corners of the globe no less! Having had the honour of being the first president of the club, I intended to start with the formation of the club. But I cannot. I held many executive positions over the years, some I even created myself, but my earliest thoughts of founding the club go back much further in time. 1989. It all started one day on my way to college, driving my shiny red 280Z, when I began spotting a white 240Z in the same parking lot, sporting a large collection of stickers. This persisted for some time until one day after searching for a local mechanic that would work on an older Datsun, I was pointed down the street by another shop owner who knew a guy who worked on Z cars. I slowly drove up the street looking for this shop and jammed the brakes when I spotted a wild looking blue 240Z race- car on a trailer. I pulled up to the shop, and saw a familiar stickered 240 sitting in the shop too! I knew I was in the right shop. That is when I met Dieter Roth. No other Z owners were present that day, and he was alone tinkering in the shop. It was through Dieter that I was introduced to JP Matte, and many track dedicated Z car owners. 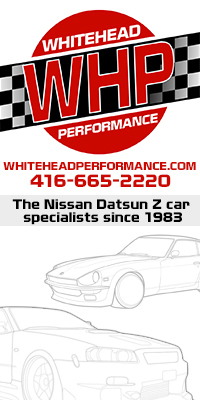 I spent the next few years going out of my way, driving all across Ontario, to meet other owners, share and learn all that I could about fixing and more importantly modifying Datsuns, as well as buying and sell- ing parts. The best part of not racing in a series is that I was only limited by money and knowledge. I didn’t have to follow any rule book stating the maximum size of carburetion venturis I could use. I began helping other owners source parts, and directed people to Dieter’s shop when they needed more help than I could provide. The “shop” became a meeting point, and any given day, you could spot at least one Z on a hoist. This got Dieter and I to talking about getting people together to swap parts, share information, and pool our resources to maybe one day rent a race track for a day just for Datsuns. Remember, this was the pre- dawn of the internet days, so organizing people was not as simple as a post on an internet forum. We came up with a “form” that described what we were trying to do and I began calling all of the Z owners that I knew, left these forms on people’s windshields, and stopped/flagged down every single Z driving on the streets, parked in driveways, peaking out of garages or slowly rusting sitting out in someone’s field. Dieter would field the phone calls during the day, and I would call them back in the evening. There were even times when Dieter would call me at home to quickly stop by the shop when new Z owners stopped by. We set up a few pre-meeting dates and waited for Z owners to stop by to chat in the shop after hours to discuss our ideas and plans for a car club. I felt that we were finally ready to start the club and organized a final meet to hold elections, decide on a name and what we were going to do first. We did hold several events and had monthly meetings, but most of the year I spent my free time spreading my enthusiasm for the club and convincing complete strangers to fork over 25 dollars for a membership number, a couple of hand typed newsletters, and some handouts for spotting other prospective members. Though renting Mosport for a Datsun day would have to wait a few years, we did get the OZC club on the track at Mosport for a spirited lap during the Mosport Vintage Festival. And...it just got better every year. Ok, been a long 20 years folks. In November 1994 a rogue JP Matte nominates me for President while we all sit in a nice earthy Z car garage at Dieter’s in Oshawa, on crates and 5 gal buckets. I accept only if he accepts my nomination for VP. It worked! I took the Pres helm from Scott and became OZC Pres #2 and it was a 10 year ride for me on and off as Pres and various other exec jobs. Dieter, the quiet inspiration never charged for his garage use for meetings and really was the guy who founded OZC as member #001. We found out to be LEGAL we needed to join CASC for insurance. Yup that $16.05 charge on your membership to pay the nickel-a-day for millions in liability at club and track events. Mark MacKew, lawyer finally got us legally incorporated to further reduce the liability to execs and membership. We grew to over 240 members at one point and monthly newsletters came hot off the presses as my credit card sorta kinda ran the club one early year money came and went fast when our total operating budget was only $300 with no advertisers back then. We would race to the Flying Scot from the printer (1st mtg place after Dieter’s) with newsletters still warm from the laser printer it was close. We started having events real events our first Z- Fest at NISSAN HQ and drag event at Sparta. Even had the pleasure to meet, and drive, the first 12 sec normally aspirated 1971 Z car in North Carolina. The owner’s name was/is Norm Simpers. And during my travels, I met some great folks at Z car Club Colorado including some track days there. We were the largest of the 6 Z clubs in Canada and rivalled those 40+ in the US. The Chicago club laughed when we said we could grow over 200 members within 3-5 years when it took them over 10. Well Hah! We did it, but we’ve levelled off to a more sustainable norm. I also had the pleasure to go to 2 ZCCA international Z car conventions and met Mr. Yutaka Katayama...the designer of our Z’s. What a man and still going at like 103 yrs. He signed my glove box in gold ink one morning something I will cherish forever. Those who have met Mad Mike Taylor unforgettable pinnacle of the ZCCA from Texas, never let go of that guy! So we were on a roll until life events took me down and kindly Nigel White took over for me when I stepped down in 2003. I am glad he is the new current president he will lead you all well and check out his white turbo 240Z! Although my Z car mechanic Chris K. passed away a bunch of years ago I appreciate the ongoing support from those like Dieter and Greg Whitehead. Greg, whose initially skeptical- sounding exhaust fix bought me 0.5 secs on the drag strip. I’m not a skeptic anymore! Many know my previous trail of sad stories from the drag strip. 1. Take care of the membership. 2. Take care of the money. 3. Keep a good slate of events to cover membership. 4. Have fun as per rule 3. 5. Publish a decent newsletter. Years ago, at our second club election in 1994, I was nominated to be President. I declined and instead nominated George Kolosowski and in turn accepted his nomination for me to be Vice President. Persuading G.K. to be our President and having him apply his organizational skills to what turned out to be the club’s biggest period of growth, was one of the best things I ever did for the club. Those early years, before and after the creation of the Western Chapter were really exciting and a bit chaotic. As VP I helped out as Newsletter Editor and even worked in a certain capacity as Treasurer. Treasurer duties, actually Collections were “interesting”, and duties in that field were mercifully brief. Years later after a turn as Eastern VP, and in response to a power vacuum which I had a hand in creating, I presided over the club starting in 2009 through to the end of 2012. I was fortunate enough to have a great executive working with me and together we held the club on a steady course. Prior Presidents and their executives had encountered some rough seas and had taken steps to improve club operations and streamline some processes which went a long way in creating the solid foundation the club currently enjoys. Looking back on it, it was my pleasure and an honour to work with some great people over those 4 years. I have enjoyed Ontario Z-Car tremendously since its creation in 1993 and have met and continue to meet wonderful people that I would not have had the pleasure to know otherwise. I am certain that my experience is not unique. Please join me and the rest of the membership in celebrating 20 great years! My involvement with OZC started just before the first Z Fest. 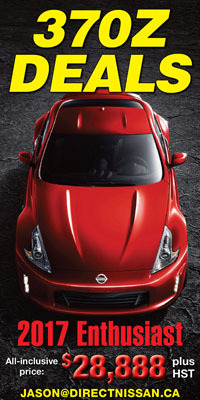 I was at that time working with Nissan Canada , was a Z owner, and heard about a small Z Car “club” through Rick Scott. Many working with Nissan at that time would have rather forgotten the rusty old “Dat- suns” of the 70’s. Most of you may recall the company had dropped the name Datsun in favour of the corporate name Nissan in an effort to re-market itself in North America in 1984. I however felt the company should embrace it’s past with more enthusiasm. After close to a year of my requests for Head Office to host a club show on our then nearly new facilities, I was given the go ahead. There was no budget provided, only some new product to be displayed and access to our tech centre for bathrooms and inside displays. I arranged for the kitchen staff to come in for the day to provide burgers etc for participants. A few members volunteered their time and we had awards created and a rudimentary method of collecting votes for class winners. We placed a few ads in the Toronto Star wheels section to promote the show and other than that word was spread by the few members we had and through local dealers via flyers. The morning started sunny and warm with a few familiar cars/owners rolling in. After a while we noticed cars and owners we did not know...potential new members! I forget the actual number of cars we had that day but it turned out to be a success and membership grew substantially as a result. The club was now well on its way from humble beginnings with a few fans and a garage home base. I was president for a few years in the mid 90’s and through that time continued to encourage Nissan’s involvement in the club. They provided club banners and also continued to host Z Fest for a number of years with it’s eventual move to our regional office in the late 90’s. It was a great time of growth for the club as we created a more involved website, promotional items such as window stickers, license frames, shirts, and an awesome newsletter. My time with the club was great. I found the member’s were extremely enthused with their cars and had a lot of pride in their rides and in the club as a whole. The executive group that I worked with made the job easy and I thank all of them for their time and effort. We had an east and west chapter which worked well ..however I must say the west side were the racers! After owning a number of Z’s I have moved on to other models of automobiles, but I still miss the fun, friendship and pure enjoyment Z owners have for their cars. All the best for another 20 years and who knows, I might buy another Z one day! Congrats to ONTARIO ZED CAR for 20 years as a club. That’s really saying something about the members and the executive! As a past president from 1999 – 2000 I know first hand what the responsibilities of the executive consisted of. I dealt with CASC getting mildly upset with an insurance issue. Apparently we were paying for three members (for years) and the actual number was in the hundreds! The club was experiencing rapid growth at this time and the executive was spending most of it’s time dealing with these issues. We incorporated the club with help from Mr. MacKew (that took a few twist and turns) and somehow I ended up running Z-Fest 2000 all by myself! I could not have done it without the help of my wife, oh and by the way that was her first and last Z-Fest. That being said we had a great core of dedicated members that were turning out in droves for the meetings. I remember counts in the 30’s for western meetings. Through out that time the quality of Zed’s kept improving as the knowledge base was expanding. I think the main reason this club has stayed together so long is the friendships that has started from having the same interest. Some of these relationships have turned into best friends. I can personally attest to two such acquaintances. We all started out with a common interest in the Zed and now have more friends because of it.